Winnie the Pooh for Jemima! 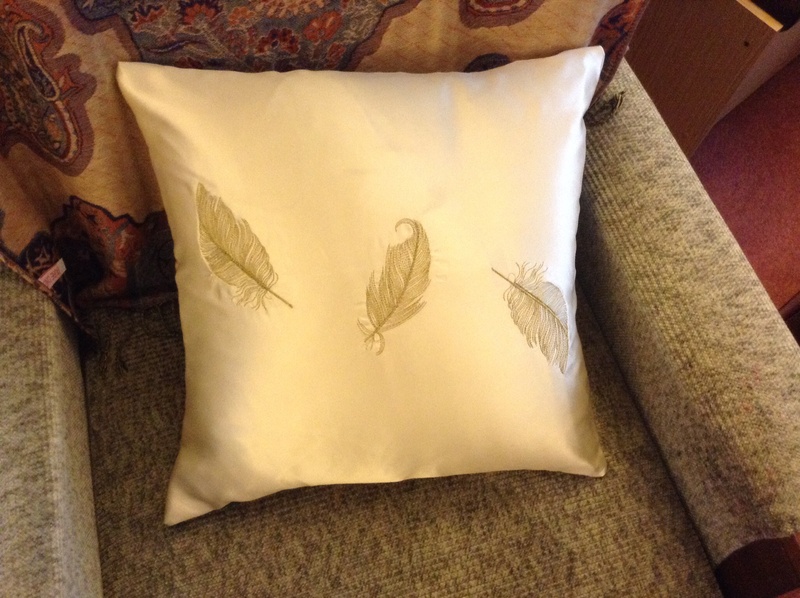 The Big Coffee Morning in Otterbourne Village Hall (10.30-12.30) on 15th March has a raffle, and a cushion! All funds to help little Jemima as she flies out to America for an operation to help with her Cerebral Palsy. 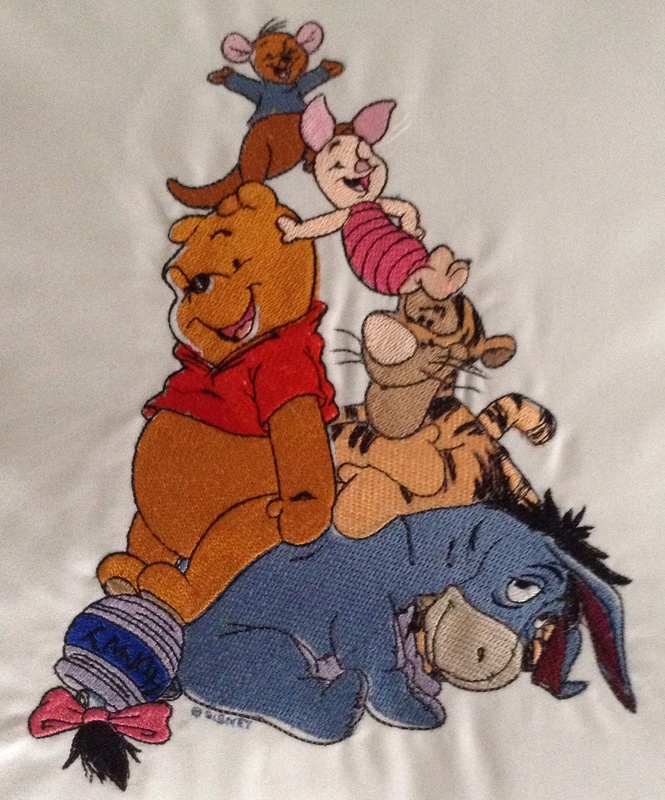 Hopefully Pooh and friends will help boost the coffers a little! I’m off to iron him a little more! Three cushions for March, and not a hare in sight! 15th March. Otterbourne Village Hall, a Big Coffee Morning helping Jemima on her journey to the States for an op to help with her Cerebral Palsy. Jemima will be flying off on the 15th, but will have so many more expenses! Hopefully Labrador Rescue will like this little chap! At last I’ve learnt to start a dense pattern on fabric and then appliqué it ( without having to do it in panic!). Daughter Sam’s old velvet curtain makes a great background! It’s an Embroidery Library pattern again (I know, but they had a special offer on!). 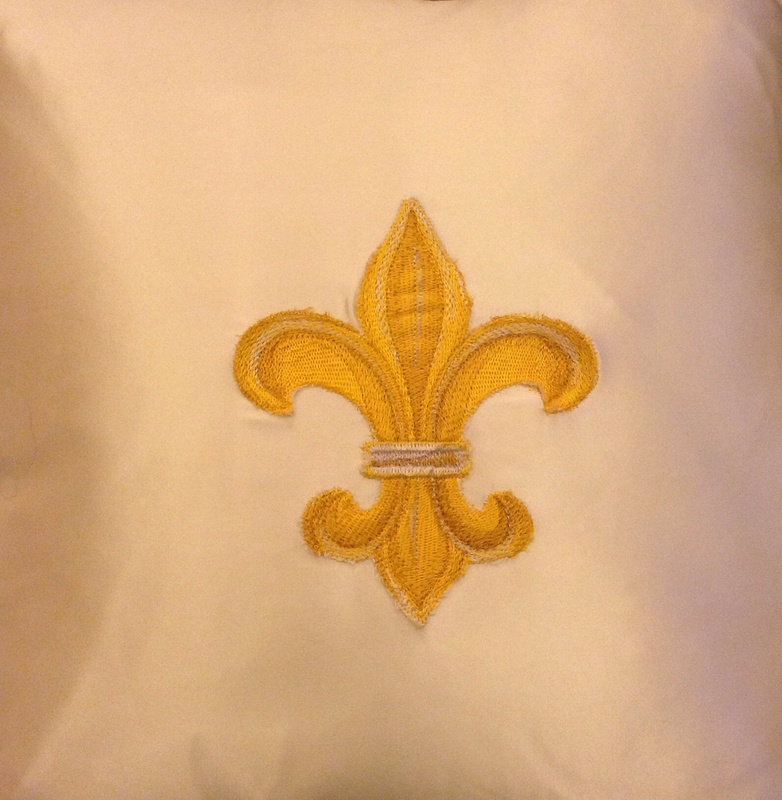 For the 1st Winchester Scouts, Cushion 75! Yes, it’s the satin wedding dress again, although I should have learnt by now that a dense pattern like this will make the fabric pucker badly, so I needed to cut out the Fleur de Lis from my first attempt and appliqué it for it to work! Please don’t let it be pouring with rain when I trundle up Winchester High Street to work Before I deliver it to tomorrow! Might get a bit soggy! The first cushion of the New Year is for “JAWS”! After making festive cushions for Christmas it took a while to work out what to make for Sheila. One of the wedding dresses that had come from my mum and dads wedding dress shop, Barclays of Havant, many years ago was a wonderful heavy cream satin. Taking care to line it and stabilise it, I think it’s pretty cool! Hopefully there’s enough fabric for a couple more! We’re SO close to £6,000! 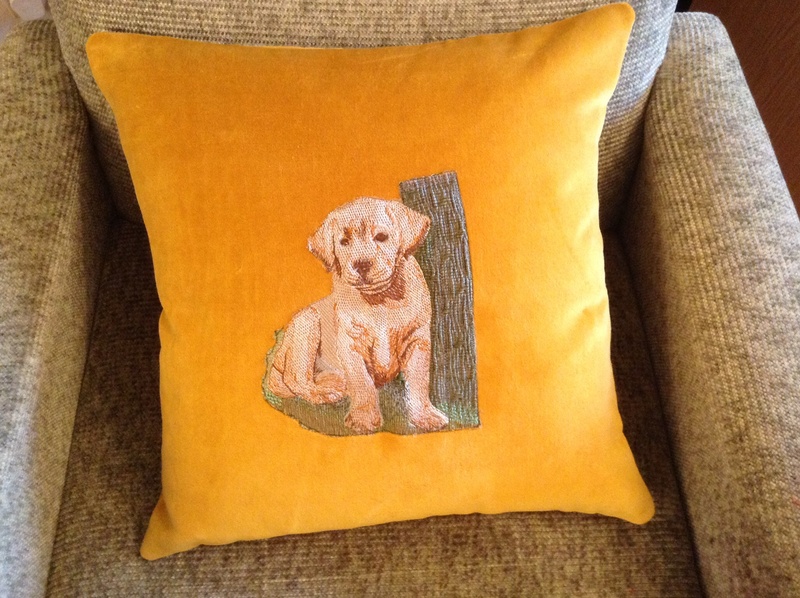 The latest total is 52 cushions gone and approx £5,911.50 made! It’s approximate because so many cushions have been in raffles with other items. It’s tempting to tweak those figures to take the total over £6,000 but I’ll be good (for now!). I’m so grateful to all those who have asked for a cushion and have worked SO hard to make money for their chosen charity. It’s humbling to see all the extraordinary projects that people throw themselves into, and all the support they receive. A special mention has to go to Pat in Highcliffe, Dorset, who has been dragging her cushion around with her for weeks and has made £404 by selling tickets for it! I will keep going til April. 2014, so if you know a charity that could put a cushion to good use in Hampshire, Dorset or the Isle of Wight, point them in the direction of the website, http://www.judygoodlet.com. I think there might be a few more results to come in before Christmas and I’ll keep you updated, but for now may I wish everyone involved in the 60 cushion challenge the very best for a glorious Christmas and New Year. Come to the wonderful Christmas Concert in Southampton on the 12th…..